Definition at line 64 of file llcheckboxctrl.h. Definition at line 140 of file llcheckboxctrl.cpp. Definition at line 187 of file llcheckboxctrl.cpp. Definition at line 217 of file llcheckboxctrl.cpp. References LLView::draw(), LLView::mEnabled, mLabel, mTextDisabledColor, mTextEnabledColor, and LLTextBox::setColor(). Definition at line 317 of file llcheckboxctrl.cpp. References LLSD::asBoolean(), LLView::createRect(), FALSE, LLUICtrlFactory::getAttributeColor(), LLControlGroup::getColor(), getValue(), LLUICtrl::initFromXML(), LLCheckboxCtrl, NULL, LLUI::sColorsGroup, LLView::selectFont(), setDisabledColor(), setEnabledColor(), and setValue(). Definition at line 91 of file llcheckboxctrl.h. Referenced by LLPanelGroupGeneral::apply(), LLPanelFaceSetTEFunctor::apply(), LLPanelDebug::apply(), LLPanelDisplay::applyResolution(), LLPanelGroupRolesSubTab::handleActionCheck(), LLFloaterScriptSearch::handleBtnReplace(), LLFloaterScriptSearch::handleBtnReplaceAll(), LLFloaterScriptSearch::handleBtnSearch(), LLFloaterColorPicker::handleMouseDown(), LLFloaterColorPicker::handleMouseUp(), LLFloaterTexturePicker::onApplyImmediateCheck(), LLFloaterSnapshot::Impl::onClickAutoSnap(), LLFloaterSnapshot::Impl::onClickHUDCheck(), LLFloaterSnapshot::Impl::onClickKeepAspectCheck(), LLFloaterSnapshot::Impl::onClickKeepOpenCheck(), LLFloaterChat::onClickToggleShowMute(), LLFloaterSnapshot::Impl::onClickUICheck(), LLPanelLandGeneral::onCommitAny(), LLPanelDirLand::onCommitArea(), LLPanelWeb::onCommitCookies(), LLFloaterSnapshot::Impl::onCommitFreezeFrame(), LLPanelPermissions::onCommitPerm(), LLFloaterProperties::onCommitPermissions(), LLPanelNetwork::onCommitPort(), LLPanelDirLand::onCommitPrice(), LLLiveLSLEditor::onRunningCheckboxClicked(), LLFloaterTexturePicker::onShowFolders(), LLFloaterLandmark::onShowFolders(), LLFloaterColorPicker::onTextEntryChanged(), LLFloaterBuyLandUI::refreshUI(), LLLiveLSLEditor::saveIfNeeded(), LLPanelObject::sendCastShadows(), LLPanelClassified::sendClassifiedInfoUpdate(), LLPanelFace::sendFullbright(), LLPanelObject::sendIsPhantom(), LLPanelObject::sendIsPhysical(), LLPanelObject::sendIsTemporary(), LLPanelPick::sendPickInfoUpdate(), LLPanelPermissions::setAllSaleInfo(), and LLFloaterTools::updatePopup(). Definition at line 264 of file llcheckboxctrl.cpp. Definition at line 251 of file llcheckboxctrl.cpp. Definition at line 95 of file llcheckboxctrl.h. Definition at line 240 of file llcheckboxctrl.cpp. Referenced by fromXML(), get(), LLFloaterEventLog::updateList(), LLFloaterEventLog::updateWindow(), and LLAlertDialog::~LLAlertDialog(). Definition at line 79 of file llcheckboxctrl.h. Definition at line 78 of file llcheckboxctrl.h. Definition at line 299 of file llcheckboxctrl.cpp. References LLView::getControlName(), LLTextBox::getText(), LLUICtrl::getXML(), mButton, mFont, mInitialValue, mLabel, mRadioStyle, LLFontGL::nameFromFont(), and TRUE. Definition at line 277 of file llcheckboxctrl.cpp. References FALSE, LLButton::getToggleState(), mButton, and mSetValue. Definition at line 147 of file llcheckboxctrl.cpp. Definition at line 172 of file llcheckboxctrl.cpp. 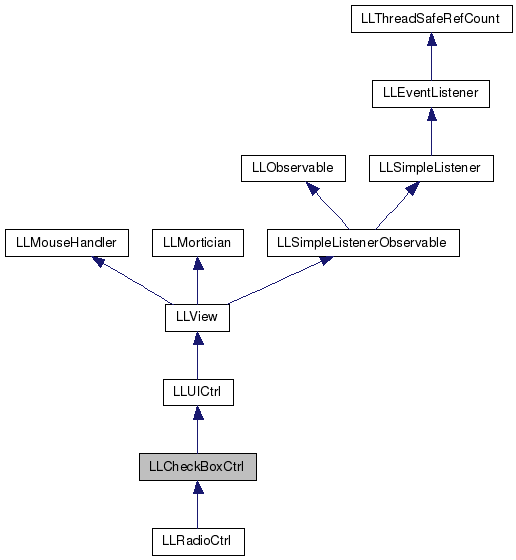 References FALSE, LLView::getEnabled(), LLUICtrl::onCommit(), and setTentative(). Definition at line 288 of file llcheckboxctrl.cpp. References LLButton::getToggleState(), mButton, and mSetValue. Definition at line 192 of file llcheckboxctrl.cpp. References LLFontGL::getLineHeight(), LLTextBox::getText(), LLFontGL::getWidth(), LLCHECKBOXCTRL_BTN_SIZE, LLCHECKBOXCTRL_HPAD, LLCHECKBOXCTRL_SPACING, LLCHECKBOXCTRL_VPAD, llmax(), llround(), mButton, mFont, mLabel, LLView::reshape(), S32, LLRectBase< Type >::setOriginAndSize(), and LLView::setRect(). Referenced by setLabel(), and setLabelArg(). Definition at line 92 of file llcheckboxctrl.h. Referenced by LLPanelGroupRolesSubTab::addActionCB(), LLPanelObject::clearCtrls(), LLLiveLSLEditor::draw(), LLPanelLandOptions::draw(), LLPanelObject::getState(), LLPanelGroupRolesSubTab::handleActionCheck(), LLPanelGroupMembersSubTab::handleMemberSelect(), LLPanelGroupRolesSubTab::handleRoleSelect(), LLFloaterColorPicker::LLFloaterColorPicker(), LLPanelDisplay::onKeystrokeAspectRatio(), LLLiveLSLEditor::onRunningCheckboxClicked(), LLPanelDisplay::onSelectAspectRatio(), LLPanelGroupGeneral::postBuild(), LLPanelDisplay::postBuild(), LLFloaterColorPicker::postBuild(), LLLiveLSLEditor::processScriptRunningReply(), LLPreviewGesture::refresh(), LLPanelLandBan::refresh(), LLPanelLandAccess::refresh(), LLPanelLandMedia::refresh(), LLPanelLandOptions::refresh(), LLPanelLandGeneral::refresh(), LLFloaterProperties::refreshFromItem(), LLPanelGroupGeneral::update(), LLFloaterBuyLandUI::updateCovenantInfo(), LLFloaterBuyLandUI::updateCovenantText(), and LLFloaterTools::updatePopup(). Definition at line 270 of file llcheckboxctrl.cpp. Definition at line 106 of file llcheckboxctrl.h. Definition at line 181 of file llcheckboxctrl.cpp. Referenced by LLPanelObject::clearCtrls(), LLLiveLSLEditor::draw(), LLPanelLandOptions::draw(), LLFloaterColorPicker::draw(), LLPanelObject::getState(), LLPanelGroupMembersSubTab::handleMemberSelect(), LLPanelGroupRolesSubTab::handleRoleSelect(), LLFloaterColorPicker::LLFloaterColorPicker(), LLPanelGroupGeneral::postBuild(), LLPanelLandOptions::postBuild(), LLPreviewGesture::refresh(), LLPanelPick::refresh(), LLPanelClassified::refresh(), LLPanelLandBan::refresh(), LLPanelLandAccess::refresh(), LLPanelLandMedia::refresh(), LLPanelLandOptions::refresh(), LLPanelLandGeneral::refresh(), LLPanelDisplay3::refreshEnabledState(), LLPanelDisplay2::refreshEnabledState(), LLScrollListCheck::setEnabled(), LLPanelGroupGeneral::update(), LLFloaterBuyLandUI::updateCovenantInfo(), LLFloaterBuyLandUI::updateCovenantText(), and LLFloaterTools::updatePopup(). Definition at line 105 of file llcheckboxctrl.h. Definition at line 245 of file llcheckboxctrl.cpp. References FALSE, LLView::getRect(), mLabel, reshape(), and LLTextBox::setText(). Referenced by LLLiveLSLEditor::draw(), and LLPanelLandOptions::refresh(). Definition at line 256 of file llcheckboxctrl.cpp. References FALSE, LLView::getRect(), mLabel, reshape(), and LLTextBox::setTextArg(). Referenced by LLPanelLandBan::refresh(), LLPanelLandAccess::refresh(), and LLPanelLandAccess::refreshNames(). Definition at line 94 of file llcheckboxctrl.h. Referenced by LLPanelObject::getState(), LLPanelGroupMembersSubTab::handleMemberSelect(), onCommit(), and LLFloaterProperties::refreshFromItem(). Definition at line 233 of file llcheckboxctrl.cpp. References LLSD::asBoolean(), mButton, mSetValue, and LLButton::setToggleState(). Referenced by clear(), fromXML(), set(), LLAlertDialog::setCheckBox(), and LLRadioCtrl::setValue(). Definition at line 103 of file llcheckboxctrl.h. Definition at line 130 of file llcheckboxctrl.h. Definition at line 121 of file llcheckboxctrl.h. Referenced by getControlName(), getTentative(), getValue(), getXML(), isDirty(), resetDirty(), reshape(), setControlName(), setEnabled(), setTentative(), LLRadioCtrl::setValue(), setValue(), and toggle(). Definition at line 123 of file llcheckboxctrl.h. Referenced by getXML(), and reshape(). Definition at line 127 of file llcheckboxctrl.h. Definition at line 129 of file llcheckboxctrl.h. Definition at line 122 of file llcheckboxctrl.h. 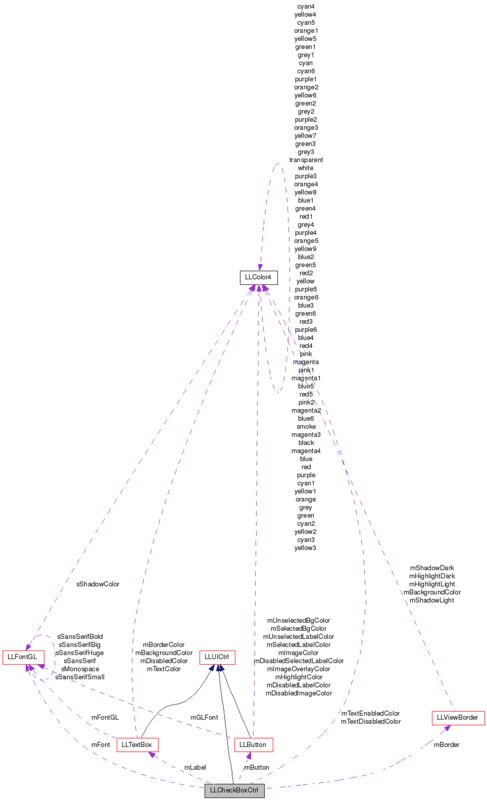 Referenced by draw(), getLabel(), getXML(), reshape(), setLabel(), and setLabelArg(). Definition at line 126 of file llcheckboxctrl.h. Definition at line 128 of file llcheckboxctrl.h. Referenced by isDirty(), resetDirty(), and setValue(). Definition at line 125 of file llcheckboxctrl.h. Referenced by draw(), and setDisabledColor(). Definition at line 124 of file llcheckboxctrl.h. Referenced by draw(), and setEnabledColor().